The Isolation Switch will be located within 5 metres of the fireplace and will generally be quite close to the ground. Please note that the isolation switch may sometimes be in a cabinet near the unit. The most common reason for resetting the fireplace is to unlock it when it reverts to “Lock-Out” mode. To take the fireplace out of “Lock-Out” mode, turn off the isolation switch for 1-3 minutes then turn it back on again. You should hear a beep from the fireplace when you switch the isolation switch back on (it may not happen straight away). After you hear the beep, you should then be able to use the remote to operate your fireplace. 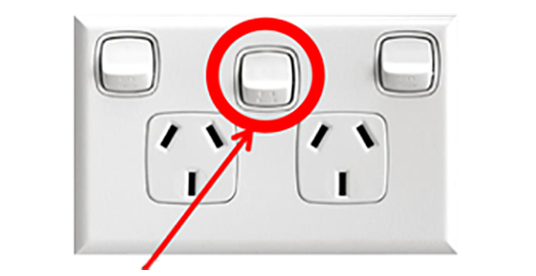 It is a legal requirement in Australian that any gas appliance with an electrical component is connected to a Double Pole Isolation Switch unless the power plug is accessible to isolate the power (AS/NZS5601.1). If you have an RC-300 multi-functional remote and need to pair the remote to the module follow the steps below. 1. Open the drop down panel at the base of the fireplace (XLR, MEZZO & i30 excluded). 2. Locate the Control Module (pictured below). 3. Move the small black sliding switch to the remote position (far right position). 4. Get a paper clip or something similar and below the switch described in step 3, is a small hole (Learn Button). Push the paperclip into the hole until you feel a button depress and you should receive a single beep from the module. 5. Once the module beeps, a GREEN LED light will start flashing for 10 seconds. 6. Within this 10 second period, push and hold down the main RED button on the remote until you hear TWO beeps from the module. 7. Once you receive the two beeps, you have successfully paired the remote to your Heat & Glo Fireplace. If you have a Smart-Batt Remote Control System and you need to pair the remote to your module follow the steps below. 1. Locate the Control Module (pictured below). 2. Make sure the switch on the end is in the REMOTE position. 3. Using a paperclip or something similar, press the Learn button on the top of the module and a single beep will be heard. 4. After the beep, press the mode button on the Remote. 5. Several beeps will be heard, indicating that the remote is paired. If you have an Intellifire REM-DLX-CE Remote Control System and you need to pair the remote to your module follow the steps below. 1. Open the drop down panel at the base of the fireplace. 3. Using a paperclip or something of the like, push and hold the Reset button until you hear TWO Beeps. 4. The first will be a short beep, followed by a long beep. 5. After the Long beep, press and hold the DOWN button on the remote until you hear two short beeps. 6. Once you receive the second long beep, you have successfully paired the remote to your Heat & Glo Fireplace.